My girl came home from nursery this week with a puzzle she had painted. As I matched up the colourful swirls, I thought the whole thing was such a lovely idea that I felt inspired to make my own – except mine would use words. It would be a poetry puzzle. 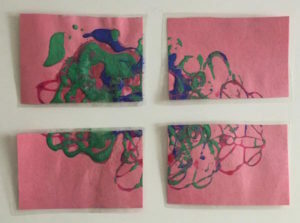 A pink rectangle of paper, with post-modern splashes of dark pink, green, blue. The nursery could have easily left it at that. My daughter would have brought her painting home, and I would have eventually filed it in a folder with all her other, similar paintings. But someone had decided to cut the picture into four and to laminate each piece. Suddenly, it was a piece of artwork and also a game. 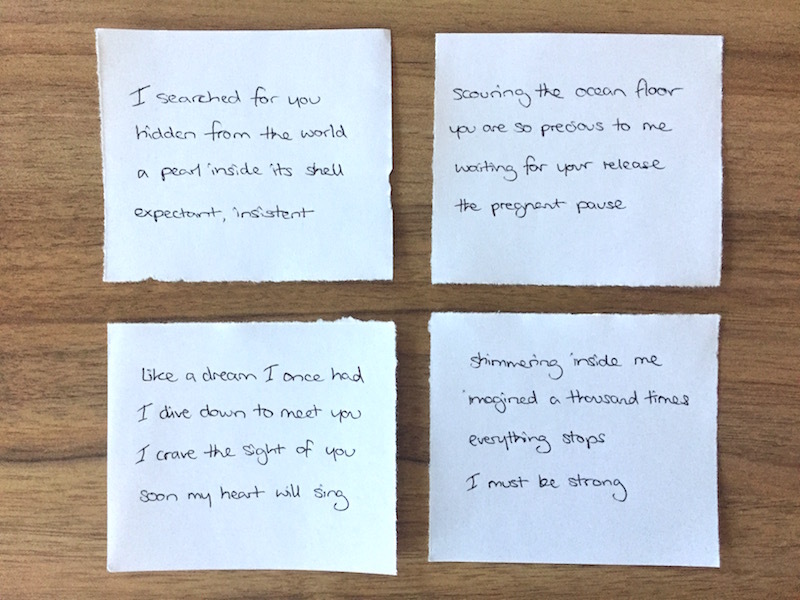 Immediately, I found myself wanting to create my own – a poetry puzzle. And I wanted the pieces to be able to fit together in lots of different combinations. Each combination would give a slightly different experience. Using my little girl as inspiration I began to jot down ideas. I had the image of an underwater seascape in my mind. And, intermingled with it, was the memory of waiting for my daughter to be born (She was two weeks late, so I was induced – a long process with some heart-stopping moments). Phrases flowed into my notebook and soon I was arranging them into blocks of text. My plan was to have four puzzle pieces, with four lines of writing on each. Cutting a sheet of paper into quarters, I began filling out my pieces. By moving them around to create different combinations, I could see which lines flowed and which needed to be tweaked or rewritten. Each phrase had to be able to work as the beginning and the end of a line. So I tried to pick phrases that captured a single thought or image (I also steered clear of punctuation, for ease). In my final version, some line combinations work better than others I think! Each puzzle piece also needed to work alone. This would allow my puzzle to make some sense even if all the pieces where placed in a line, whether vertically or horizontally. To achieve this, the phrases within each individual block of text had to flow – at least in a general way. Do you like the idea of a poetry puzzle? Give it a try! Or check out the writing ideas section of this blog for more inspiration. This is excellent and feeds into my workshops about to restart through Lapidus Scotland where we learn how to make art the we write. One of the mediums I use is encaustic art this would be good to use for this puzzle. Thanks for passing on. Thanks Janie, glad you like it. I’ve been finding out more about encaustic art – looks beautiful, and so much fun! Something I’d like to try. Hope the workshops are going well.